We are extremely grateful to the increasing number of people who have decided to donate to Against Malaria as a direct result of our positive ratings from GiveWell (see previous post). The individual amounts vary from the equivalent of a single net to a recent donation which would cover over 18,000 nets. In total almost US $250,000 has been donated by people who told us they heard about AMF through GiveWell. We'd like to wish everyone a happy holiday season and a fantastic 2011. With your help we have passed many milestones this year and hope to do the same, if not more, next year. Thank you for your support. It is hugely appreciated. If you are having trouble finding a seasonal gift then perhaps Nets Instead could be the answer! We'd also like to let you know that we now have a 'recurring donation' facility which is an option whenever you make a donation. Malaria is not an equal-opportunity disease. Children under the age of 5 and pregnant women are significantly more likely to contract malaria, so these vulnerable groups require special attention. To save lives most effectively, our combined efforts must ensure that children and pregnant women receive, understand and use crucial bednets. According to a recent WHO study,34% of households in malaria-prone regions owned an insecticide-treated net, but only 23% of children under 5 years, and only 27% of pregnant women, slept under one. That discrepancy is immensely concerning. If the international community hopes to achieve the 2015 Millenium Development goals for child and maternal health, these vulnerable groups need to be our priority. Thankfully, our distribution partners recognize this. Save the Children recently distributed 20,000 nets in Malawi using a method that prioritized households with the greatest number of children under 5. Concern universal targeted 15,000 pregnant women with its Phalombe Malaria Communities Project in Malawi. Be sure to check out these organizations' distribution proposals as well as the proposals from other non-profits. We make sure that every proposal from every partner is available online so that you know exactly where your money is going. Zambia is a landlocked country in southern Africa. Malaria has staggered the nation for decades - as recently as 2006, malaria was its number one killer, accounting for half of all deaths in Zambia. 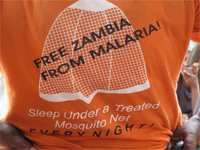 But in spite of this seemingly insurmountable malaria burden, Zambia has achieved unprecedented progress. Since 2000, malaria infection rates in Zambia have dropped 66%. So how does such a remarkable reduction happen? Between 2006 and 2008, 3.6 million nets reached Zambia's populace. And in this three year period alone, malaria deaths dropped by half. These nets were not provided by the Zambian government, which couldn't afford the nets by itself. They weren't bought by Zambian families, 73% of whom live below the poverty line. Instead, it was international donors who paved the way for Zambia's incredible change. In short - it was you. Thanks to you, AMF partners have distributed 332,660 LLINs to Zambia. That's a full 25% of all the nets our partners have distributed in the world. Check out our distribution partner World Vision to see some pictures of completed distributions in the country. And remember: Zambia is only the beginning.